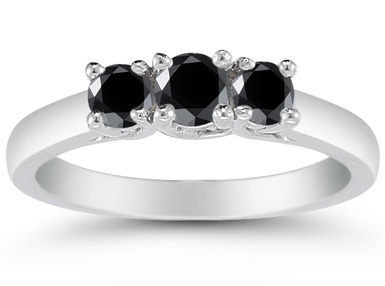 Three jet-black gemstones triple your fashion sense in this ring from Apples of Gold. The three stone combination is given a makeover by using three black diamonds. Each of these precious stones gives a distinct opaque color to the ring, all with the diamond value appeal. The fashion conscious won't be afraid of these black diamonds going astray because they're set in high quality white gold, with four prongs to keep them in place. A clean white gold band completes the minimalist, chic look. Also available in 14K Yellow Gold (shown below), 18K Gold or Platinum by request. We guarantee our 1/2 Carat Three Stone Black Diamond Ring, 14K White Gold to be high quality, authentic jewelry, as described above.